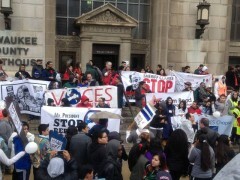 May Day march in Milwaukee demands: Stop ICE raids in the courthouses! | Fight Back! Milwaukee, WI - In the drizzling rain and chilly temperatures, several thousand immigrants, workers and family members marched from Milwaukee’s South Side to the County Courthouse downtown, demanding an end to ICE raids in the courts and legalization for all. In recent months, it has been revealed that the local Immigration and Customs Enforcement (ICE) office has been sending plainclothes agents to the municipal and county courthouses to detain any undocumented immigrant they can get their hands on. Utilizing this illegal practice, hundreds if not thousands of immigrants have been detained and deported - the vast majority not having committed any crimes. Mothers have been detained and deported after visiting the court to get a birth certificate for their newborn child. Countless immigrants have been deported for paying off parking and driving tickets at court, since the undocumented are not allowed to have drivers licenses in Wisconsin. 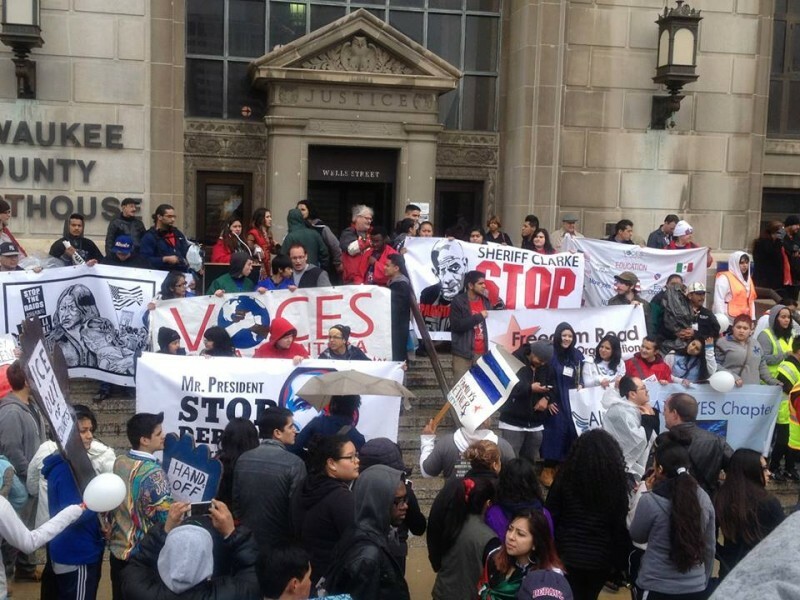 For these outrageous actions, and as 1100 immigrants are daily being deported from across the country, thousands of Milwaukeeans rallied at the County Courthouse May 1, saying “Ya basta!” to ICE and the racist immigration system. Commenting on the smaller size of the march this year as compared to previous ones, organizer Denis Montero said, “I think people feel cynical and see no end to the struggle. We need victories to keep momentum.” With Congress stalled and unable to propose any useful reform, it is becoming more evident to the immigrant rights movement that the demand must be on President Obama to grant Deferred Action for all 11 million undocumented immigrants. The movement in Milwaukee will continue to organize around this demand, along with the local fight to drive ICE out of the courts.